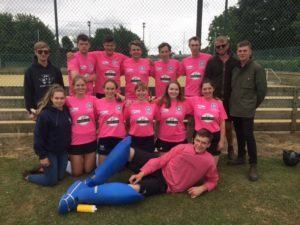 A talented contingent of Young Farmers from Cambridgeshire have joined to make up Cambridgeshire 1st VII Hockey team coming 2nd in Eastern Area Sports camp competition. 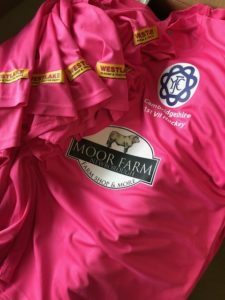 Print Solutions were approached to supply the kit which needed sponsors (Moor Farm Shop, Mees Blueberries and Westlake) logos applying, along with players names and numbers in time for their first match 42 hours later. 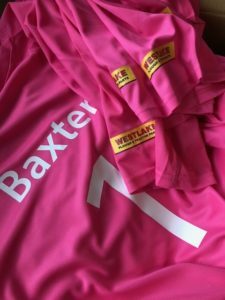 We suggested various brands and products but the team chose AWD Polyester breathable sports top with contrasting shorts with it’s vibrant iridescent pink colour allowing them to stand out from the crowd. We wish them well for the future!